In the lands of Godville there is no such thing as a regular scientist because scientists spread theories about non-existence of Gods and other crazy things of how life is supposed to be just a big page of text, this is considered great blasphemy and they themselves are considered mad and godless. 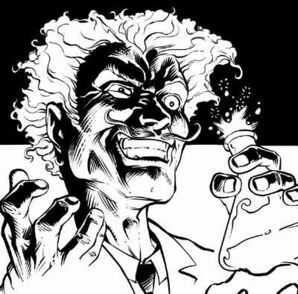 Mad scientists do not have an aggressive nature, although they will attack you if they consider you a good specimen for one of their crazy experiments, if they defeat you your body will probably be used to create a 'Prankenstein'. Mad scientists do not seem like a big threat, but they are highly intelligent and have access to 'witchcraft' that has never been seen in Godville.